Good Sunday morning to you all! This week at Christmas Card Challenges we have a beautiful inspiration photo for you. 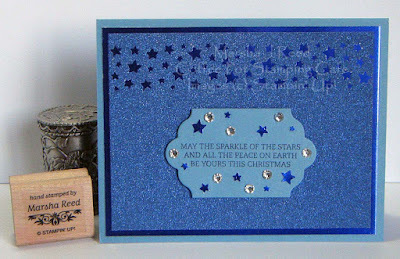 Because I love blue and because the inspiration photo featured blue, I used different shades of blue for my simple design with a star theme. I do hope you can join us and show us what you were inspired to create. Not only does the Confetti Star Punch make for a pretty border, it also gives you bunches of little stars that you can use for other projects. They would be great for use in a shaker card. Stamp Sets: Christmas Bliss (sentiment), Christmas Lodge (sentiment on inside) - retired; Ink: Night of Navy; Cardstock: Foiled Cardstock Stack (DCWV), Glitzy Glitter Cardstock Stack (DCWV), Marina Mist; Accessories & Tools: Confetti Stars Punch, Lots of Labels Framelits Dies, Rhinestone Basic Jewels, SNAIL Permanent Adhesive, Multipurpose Liquid Glue, Stampin' Dimensionals, Stampin' Trimmer, Big Shot Die-Cutting Machine. All Stampin' Up!® product unless otherwise note. 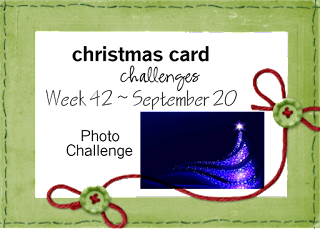 For all the challenge details and Design Team inspiration, visit Christmas Card Challenges.